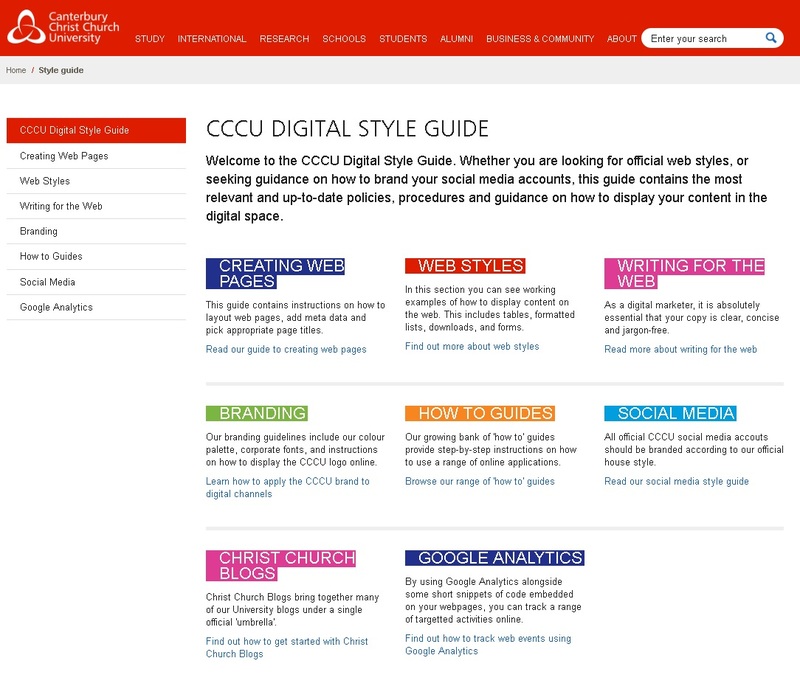 In my role as Web Editor for the Faculty of Social and Applied Sciences at Canterbury Christ Church University, I was responsible for all web content situated within the Faculty section of the website, representing four academic schools, and a range of external facing service providers including the University’s Sports Lab and Mediation Clinic. Though initially a project-based appointment, my role was made permanent in March 2015, and evolved significantly to the effect that my role became effectively split between web editing, and digital marketing in its widest sense, offering marketing consultancy, social media training, and supporting the successful integration and launch of a range of online campaigns. In the first phase of this project I conducted a full audit of existing content. This included a review of all web pages situated within the Faculty section of the University website, as well as external content hosted through blogging sites and social networking platforms. I also worked with key stakeholders including the Dean of the Faculty, Departmental Directors and other content owners, assessing their needs and matching their expectations to what could be achieved within the new web templates. The deadline for the launch of the new pages was very tight – only four months after the start of my contract. I also had to contend with the impending change to the way the Faculty was structured, with ‘Schools’ replacing ‘Departments’, and reflecting these changes in the new web templates. Another key part of the project was to enhance the quality of all Faculty content to make it more engaging and user-friendly. This involved re-drafting many pages of content, and sourcing new material from across the Faculty in time for launch. This project was completed on time and to specification, ahead of the other Faculties, and with less time in which to complete the project. Following the success of the content migration, the next stage was to conduct a full review of the project to date, assessing the quality and marketing ‘effectiveness’ of the new pages in light of further developments from the web team. The first part of this process involved setting up review meetings with stakeholders from across the Faculty, in which I was able to share best practice between departments, and engage academics and administrative staff in the online ‘project’. At the same time I also benchmarked the most effective internal pages (i.e. other faculties) and external pages (i.e. our competitors) against my own, taking lessons from examples of successes, and integrating my own marketing expertise into the content creation process. I was also able to use newly collected data from Google Analytics to assess the relative merits of certain web pages, and worked closely with the digital team to find ways to surface key content in the University’s top level corporate pages. Social media training and support. Proactive Search Engine Marketing (SEM). Liaising with third parties to launch online marketing campaigns. Creating bespoke PPC landing pages. Developing web-forms for online applications. Filming and editing videos for use on social media. Flagging institutional marketing issues with senior members of staff. In addition to the above, in early 2015, I took on extra responsibilities on behalf of the newly launched UK Institute for Migration Research (UK-IMR). This work has involved liaising with the Institute Director, as well an external web design agency to provide extra value to my Faculty during my time working at CCCU. I left my role as Web Editor in February 2016 to seek out new challenges with the IT department. Though I left with a heavy heart, I know that I left the Faculty in a very good position. At the time of changing roles, the Faculty of Social and Applied Sciences was the most-visited Faculty within the University, attaining visitor numbers that were typically as good as two other faculties combined. From a standards perspective, our web designer reported that my pages were by far the best in terms of presentation and content, and the pages are often used as a benchmark for the institution.